Somewhere around Thanksgiving I decided to try starting my day (again) with lectio and silence. No matter how pressed I feel for time, when I get to my office or when I scoop up Lucia and head to the porch, I try to lend some space for breath and nothingness and silence. Here I am in August and I’m still doing it, so there’s something. But the reason I’ve been practicing some form of centering prayer for over a decade now is not because I’m good at it or because it’s easy, but because as with any discipline, it reminds me what a spiritual novice I really am. Case in point: for several years after Lucia was born, because she needed and loved (and still loves) to be held, I struggled to find just ten minutes a day when my hands were free to sit in silence. But in the last ten months, I’ve finally realized something: I’m much better at praying when I’m holding Lucia. If I’m in my office alone, like I was this morning, I’m surrounded by my books and my responsibilities and distractions, and when an idea comes to me, my hands are instantly busied, trying to scratch down that idea on paper before it flees. My eyes flutter open and my attention floats away from prayer to the day ahead of me. But if I’m holding Lucia, I can’t use my hands. When my eyes open or rest upon something, they often rest upon her, subtly bringing me back rather than away from the intention of it all. Lucia’s voiceless expectation, the hopeful way her eyes dart and wander and peek up at me lead me back to the very present act of holding her, and being with one another–and our just being with God. What I often count as an aberration, an intrusion from the true beauty and solace of our backyard view of nature–the screech of a large truck coming to a halt or a car horn blaring–Lucia accepts with diligent curiosity, reminding me just how fickle and narrow my own attempt at spirituality can be. Indeed, it is only through this quiet discipline that I’ve come to realize that acceptance, such willful abiding in God’s presence, is anything but passive. Rather it’s what I continue to yearn for after all these years, and that God has placed beside me a great spiritual teacher in my tender daughter is not so much a great irony, but a sweet revelation. I’ve always believed that you do not need words to pray, yet even my own beliefs can assert themselves so willfully that the prayer become secondary. But I’ve never so palpably felt the resonance and profundity of that quiet as when I’m in God’s presence with Lucia alongside me. Morning prayer with Lucia on the porch. My photo. And would you believe it? My second prayer word that I’ve been wrestling and striving toward all these years so ungracefully and confusedly is none other than abide. And in leading me away from myself and toward attention to others, to my world, and to God, God continues to urge me to appreciate and learn from different ways of being. Different ways of being that are good and perfect gifts. Different ways of being that are of God. Different ways of being that change us for the better, that lead us to learn from such wordless, sanctified offerings of pure, unadulterated delight that God has so generously made. 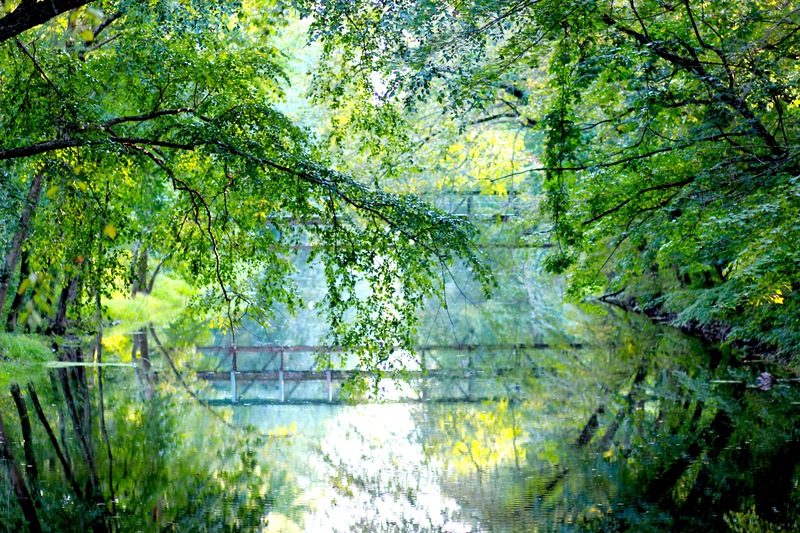 My friend, Mihee, writes a wonderful blog called First Day Walking, and she’s been so gracious to feature an essay I wrote on Centering Prayer for her Merely Beloved series on Spiritual Disciplines. You can click over and read my essay here, or scroll down, and if you’re just joining us from Mihee’s blog, welcome, welcome, welcome! If you’re wanting to learn more about my practice of centering prayer, there’s a whole slew of posts here. Also feel free to hunt around the blog and get to know me: my Two Years in China post has some highlights of what I’ve been up to these past few years and lately I’ve been blogging about reentry to life here in the United States and the people I love and miss in China. Please leave your mark in the form of comments: I’d love to get to know you! I remember vividly that my love affair with centering prayer began in my senior year of college. I was pursuing a call to ministry, poised to move first to Puerto Rico and then onto Washington, DC to serve the poor, and becoming exhausted with finding myself betwixt and between empty praise and worship and stodgy skepticism. I longed for a place where the presence of God, not our wanton human wisdom, was paramount. The end of summer on the D&R Canal, Princeton, NJ. All photos by Evan Schneider. Somehow I found my way to the little Catholic circle on my Presbyterian campus, a motley crew led by a renegade lady who didn’t seem to think it weird that everybody called her Pastor and who was convinced that service and contemplation went together. In the little workshop in which she roped me in, she taught us the ins and outs of lectio, the intentional listening for God while reading scripture (in contrast to the very real Bible school temptation to try to unravel the whole meaning of the verses in just a few minutes). 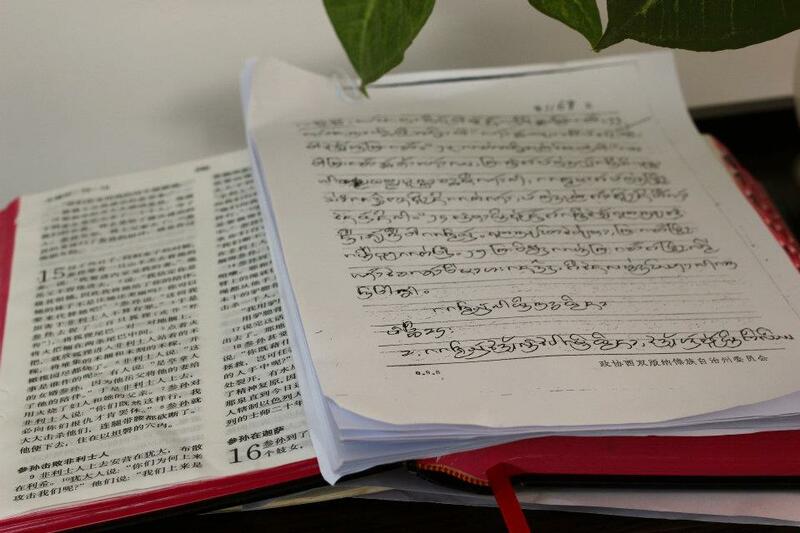 Mandarin Bible with Dai language translation notes. We were reading Ephesians 3:14-18, incidentally one of my favorite passages since youth, closing our eyes and earnestly seeking God, and then going around and sharing the words or the phrases that stuck out to us. When the Pastor got to me, I shared my word, “grasp,” only she revealed to me that that word wasn’t actually in the text for today. “Don’t worry,” she said, “that happens frequently,” with a smirk and a chuckle, and I was awestruck by how nonchalant this Catholic woman could be about minor miracles in our midst. It turns out that repeatedly hearing the NIV version of that scripture growing up probably put that word in my head, but maybe God wanted me to hear it, too. When I began to come to the Catholic circle with regularity, where they not only closed their eyes and listened to scripture with their hearts, but sat for thirty minute silent prayer sessions, I also began to use grasp as my prayer word, to which I could return my heart, as I did with my eyes to the candle burning in the center of the room, if my mind wandered. Pastor Barb, despite her high energy and her electric personality, had this ease about her, this sense that prayer was about so much more than words, and that communion with God was meaningful even when it didn’t feel like anything, even when nothing happens. As far as my own life is concerned, the mystery of centering prayer seems to be just as much about what happens outside of the prayer as in it. During nearly six years of practicing centering prayer in the barrios of Puerto Rico, in our nation’s capital, and on the campus of Princeton Theological Seminary, that word grasp took me on a journey from grasping for God, to realizing that God has been ever and always grasping for me. Shortly after moving to China, I felt compelled to choose a new prayer word, and whereas grasp at least implied God’s action, if not my own, the word to which I was led, abide, seemed to denote the essence of passivity. 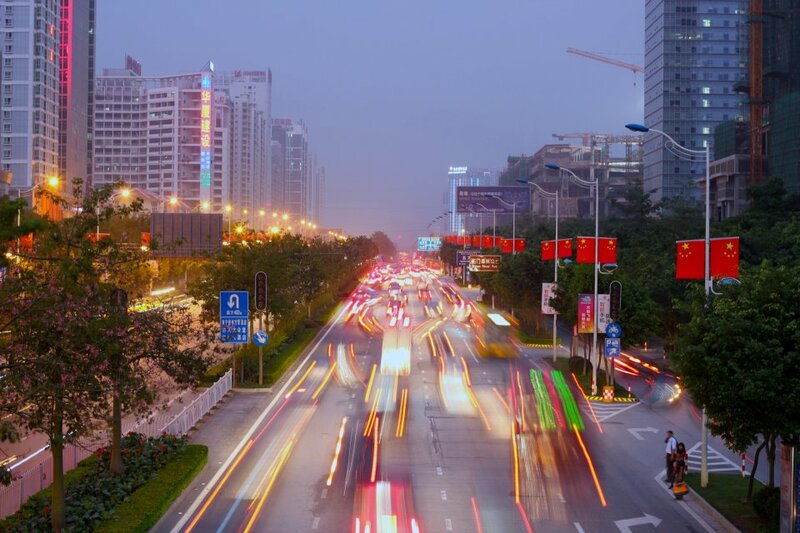 Cars whiz by in Nanning, the capital city of Guangxi, China. But as I’ve lived and breathed and been silent with it a bit more (and trust me, silence was something I craved in a city of nearly 7 million! ), and as life in China unfolded to show me that not only is control merely an illusion, but that God is also greater and more faithful than I ever imagined, I realized that abiding is quintessentially the opposite of distraction, and centering prayer not only the art of intention, but the willingness to let God lead the way. 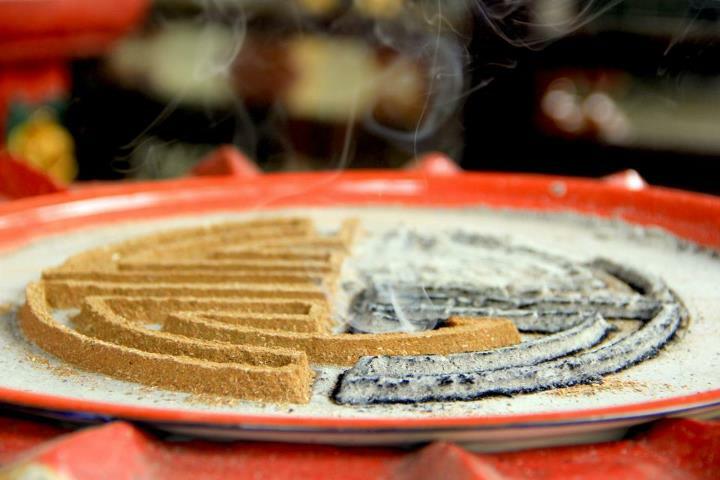 Incense labyrinth in a temple in Kunming, China. Maybe the reason lectio and centering prayer have been so profound throughout the ages (some say they date back to the Desert Fathers, at least to the Benedictine monastics, and amazing people of faith like Teresa of Avila, John of the Cross, and modern-day monks in American Catholicism like Thomas Keating) is because they’re not just a different way of praying, but the opposite of what we as human beings would normally do. We’ve been trained, in the West, if not hard-wired, to dive into scripture and faith and religion with our minds. As an M. Div grad and a Ph.D student, I especially struggle with the mind’s endless critiquing, probing, meandering, and if you will, having a mind of its own! But what’s active in centering prayer is explicitly not the mind–the mind’s to be quieted to allow for the Spirit to grow, reside, and even meander. My discipline has changed as I’ve grown. Whereas earlier on, I was very conscious of clearing the mind and letting go of all thoughts, I’ve become less legalistic and more open to some of the lingering, nagging voices that exhibit themselves in that silence, more open to the myriad manifestations of God’s presence. 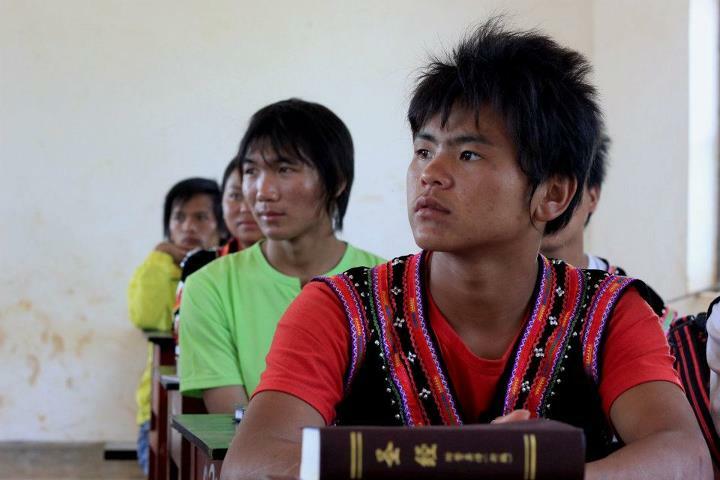 Young minority Christians at a Bible training school in the mountains of Yunnan province. I’ve closed my eyes in just about every fabulous place I’ve ever had the privilege of traveling to. But I’ve never regretted those moments of silence, nor have I ever been really alone. You see, doing centering prayer in community way back in my college days always made sense to me. It’s not an easy thing to commit to those fifteen or thirty minutes on your own, but with safety in numbers, it’s somehow easier to open up to God fully and freely. At Princeton Seminary, we’d sit in my crowded dorm room and attempt to block out the stress and the theology and the gods we often worshipped to welcome God in a very intentional way. And in China, my dear friend joined me over skype, across an ocean, and a twelve-hour time difference, and yet the practice couldn’t have been more fruitful. She says that after all these years, because we both still have a hard time with silence, it sometimes helps her to look up and see my peaceful face, the ups and downs of the breaths in and out of my chest, and my eyes closed, and and I feel the same way. Believe it or not, silent prayer isn’t meant to be a solitary, distant practice. As Pastor Barb made clear back in the day with her penchant for social action, it’s meant to take us from detachment, to intention, to communion with God, and into community. I know it sounds impossible, bogus, even, that a practice of silence and contemplation would awaken Christians to community, to love and to justice. And I know it’s not for everyone, my own husband doesn’t take refuge in silence the way I do, and I think that just speaks even more clearly to God’s myriad of manifestations. 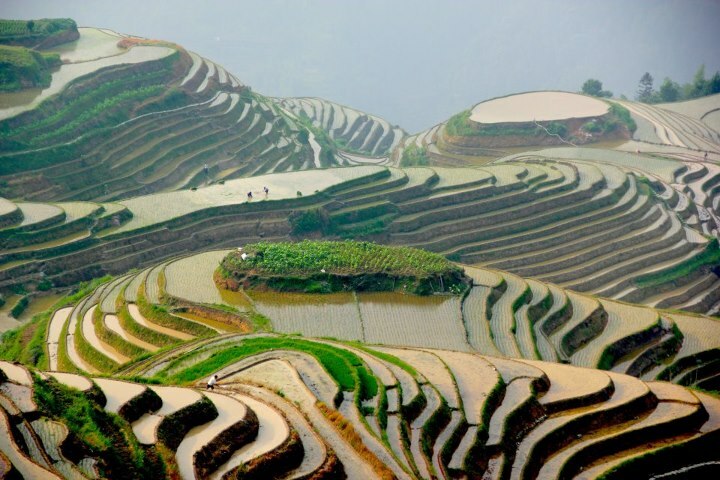 Rice terraces in Guangxi, China. All photos by Evan Schneider. This one, this discipline, is not for everyone. But if you’ve ever struggled to hear God above all the other voices, if you’ve ever lost touch with your heart or your spirit, or wondered about the work of the Holy Spirit, you may want to start closing your eyes and listening to your breath, reading scripture with the eyes of your heart, seeking communion rather than answers, and being open to God’s presence not just in these times of silence but everywhere in the world. For further resources on the discipline of centering prayer, consult J. David Muyskens’ Forty Days to a Closer Walk with God, Sacred Breath, or Richard Rohr’s Simplicity for more on contemplative action.